Most people have heard of a tummy tuck, also known as abdominoplasty. The procedure is intended to tighten back up the abdomen area after childbirth, gaining and losing weight, or just the sagging that is a part of natural aging. Here are some other facts about tummy tucks from Dr. Kearney for those considering the procedure. A tummy tuck won’t help you get rid of excess pockets of abdominal fat such as love handles or a muffin top. Dr. Kearney may recommend combining liposuction with the procedure to remove these pockets of fat. In general, a tummy tuck is designed to reduce the appearance of an abdominal bulge and accompanying stretch marks. A tummy tuck can’t be performed together with a C-section. 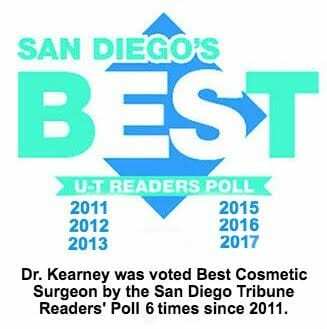 Although there could be similarities in the way incisions are made between the two, Dr. Kearney insists that his patients wait at least six months following childbirth to have a tummy tuck. The surge of hormones and fluid retention immediately after childbirth may make it difficult to figure out the extent of abdominal laxity and slackened abdominal muscles. Numbness following a tummy tuck procedure is common. Why? Because nerves are severed around the incision site, plus the skin is lifted, also affecting the nerves. As the nerve endings regenerate and adapt, the numbness will gradually disappear. A tummy tuck is not a weight loss procedure. Dr. Kearney advises his patients to be within 10% of their ideal body weight before opting to have the procedure. A tummy tuck can be performed through a wide variety of techniques depending on the patient’s individual needs. The procedure can be stand-alone, or can be a part of a more extensive mommy makeover, targeting various areas affected by childbirth and breastfeeding. If you have any questions about a tummy tuck or any of Dr. Kearney’s other procedures, don’t hesitate to give us a call at 800-671-1951.